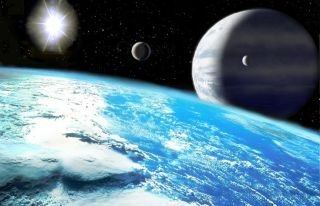 Extrasolar planet Upsilon Andromedae d lies in the habitable zone and if sufficiently large moons of Upsilon Andromedae d exist, they may be able to support liquid water, as the image shows. On the horizon of this hypothetical moon can be seen Upsilon Andromedae d, possibly a class II planet (Sudarsky classification): since it is too warm to form ammonia clouds this ones are made up of water vapor, white in colour instead of the caracteristic yellow-reddish clouds of Jupiter and Saturn. To understand how this strategy works, one can think of all light waves as electric fields rippling either up and down, left and right, or at any angle in between, a property known as polarization. When starlight gets scattered off a planet's atmosphere, its polarization changes in a way that makes it distinct from both the direct light from a star and the light bouncing off the surface of a planet. Analyzing this polarization, a technique known as polarimetry, could yield details not only concerning the existence of an alien atmosphere, but also its composition and how it might be structured into different layers. "Polarimetry provides extra information over photometry — measuring planet brightness at different colors — because there is extra information encoded in the polarization of scattered light," said astrophysicist Sara Seager at the Massachusetts Institute of Technology, who was the first to propose polarimetry studies for exoplanets. "This extra information can tell us whether or not clouds or hazes are present, and something about the properties of the clouds or hazes. It's information that is difficult to get any other way." The canonical example are the clouds of Venus, Seager explained. "Very early in planetary atmosphere studies, people thought Venus could potentially have water clouds," she said. Although photometry measurements of Venus could not uniquely identify the droplets in these clouds, polarimetry studies from ground-based measurements reported in the early 1970s discovered the Venusian clouds were sulfuric acid droplets, findings confirmed via spacecraft sent to the planet. One disadvantage of this method is that the farther the planet orbits from its star, the fainter it will be. This means only the closest-in planets can be studied with this technique, which means it won't be of much help finding new exoplanets — existing planet-hunting strategies are already quite good at discovering worlds that are near their stars, Wiktorowicz said. Still, he noted this method is not meant to find new planets — "rather, it's meant to study planets we already know about." Spectrum of planet around HR 8799. The search for exoplanet atmospheres using polarimetry has taken place for nearly two years with POLISH2, which is attached to the Lick Observatory's 3-meter telescope. "It's amazing to think that we might be able to see light scattered from the surface of a planet tens of light years away," Wiktorowicz said. To overcome this challenge, the researchers have to account for all the minute disturbances the polarimeter may experience nightly — to set the scale to zero, essentially. They do this by looking at nearby stars. The light from these stars tends to have almost no polarization, and thus helps calibrate every other measurement the instrument makes. In contrast, light from more distant stars has encountered more interstellar dust grains, which can reflect away some polarizations of light but not others, making the light from them that does reach Earth polarized. To increase his chances of finding planets, "I'm currently working on improving my data-processing software, because squeezing out every last drop of information from 500 gigabytes of data per night can be difficult," Wiktorowicz said. "Once this is done, I will re-analyze my old data, while gathering new data as well, and hopefully detect some planets." This strategy involves monitoring exoplanet systems at different times in that world's orbit. "I'm spending most of my effort on two stars known to have one planet each," Wiktorowicz said. "But I have recently added three more stars, and the list will increase with time." In the end, "I hope to be able to study a few tens of exoplanets," he added. Seager , who did not participate on this work, noted, "research with exoplanets is pushed forward only when people like Sloane are brave enough and bold enough to push a technology most people don't think is viable."